She will make an appearance on the 30 Rock series finale. Moore, of course recurred a couple years ago as Jack's childhood crush from Boston, Nancy Donovan. She and the head of Microwave Programming briefly lived together until Nancy learned Jack had knocked up Elizabeth Banks' Avery. The sitcom's final episode airs on January 31. Will Jack and Nancy end up together? 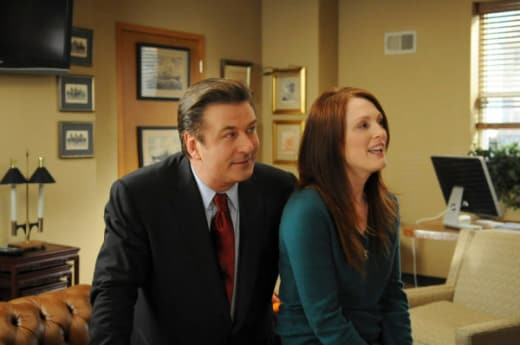 Toggle through our section of 30 Rock quotes as you ponder their future as a couple.